Today's CAS Challenge from SCS (CAS172) is a theme challenge - LOVE. Everyone is welcome to join in the fun of the challenge, so come play along with us! I have a few Fiskars stamp sets that I bought from one of my local Dollar Stores ... they were $3 each and have at least a dozen clear stamps in each set - what a bargain!! Anyways, there is one set called "Love Bug" and I wanted to use the lettering from that set for my sentiment / main focal point. I paper pieced the LOVE word in Melon Mambo polka-dot DP --- love it!! It needed something more, so I pulled out a set from SU! from a couple of years back called Valentine Defined. I just love the heart stems from this set and thought they would make a perfect backdrop for my sentiment. Hope you like. 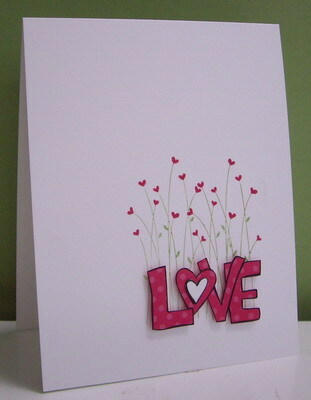 Colored the heart stems with Stampin' Write markers and stamped twice onto my white card front. Stamped the sentiment onto Melon Mambo polka-dot DP and cut it out. Stamped it a second time onto white cardstock, cut out the center heart and glued it on top of the polka-dot DP. Placed the sentiment overtop of the ends of the stems, popping it up with dimensionals. Added one set of heart stems to the inside. Easy and fun card to make! Labels: CAS, fiskars, love, paper piecing, Stampin' Up! Love the clean simple look to this. Thanks for sharing. have only recently subscribed to your site. Love the cards, this is my style of card, simplicity itself. Oh this is sweet and so lovely Loll. Genius with the sweet little flowers.